Most people that know me know that I’m a fan of The Simpsons. 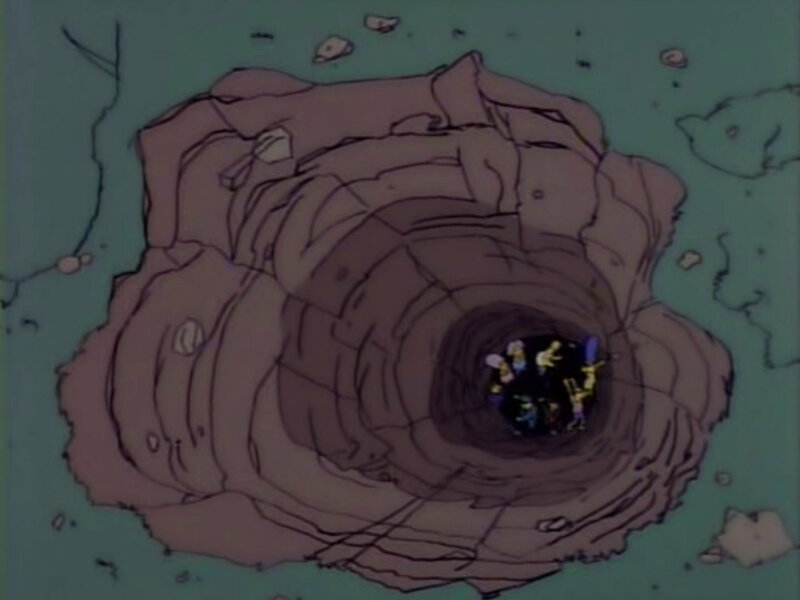 There’s a scene at the end of a classic episode, entitled “Homer the Vigilante,” where several characters, including Homer Simpson, Otto Mann, Mayor Quimby, and Police Chief Wiggum are stuck in a hole, looking for a non-existent buried treasure. On October 27, 2015, Brampton City Council decided, in a 5-4 decision, to terminate the provincially funded LRT line at Steeles Avenue. Council was pressured by local opposition from wealthy landowners on Main Street South and several downtown businesses. Construction on the shortened transit corridor is scheduled to begin in 2018. After rejecting the recommended surface alignment, Council asked staff, which twice recommended the original surface route, to come back with alternative alignments. Late last week, staff released its report on the various options for extending the Hurontario LRT from Steeles Avenue (Shoppers World). That report, buried in a large PDF document, starts at page 238. The report will be brought to the Planning and Infrastructure Committee on Monday, March 7, and will likely presented at a special public meeting on Monday, April 18. Yesterday, in Bramptonist, Divyesh Mistry summarized the report’s recommendations. Staff recommended two tunnel options. Both potential tunnel alignments would extend from a portal between Elgin Drive and Nanwood Drive under Main Street to the GO Station, either with underground stations at Nanwood and Wellington Street (at Brampton City Hall and Gage Park), or running straight through without stops, but a new surface stop at Elgin Drive. The first option, with underground stations at Nanwood and Wellington, would cost $570 million; the second tunnel option would be cheaper, costing $410 million. The tunnel would have to clear the Etobicoke Creek bed, and each underground station would require stairways and elevators to provide access. Staff recommended that council authorize $2.5 million for a new transit project assessment process (TPAP), including technical and design work, that would take two years to complete. Of course, cheapest and most obvious option, running the new light rail line on the surface between Nanwood Avenue and the Brampton GO Station, was “removed from further consideration per Council direction.” Various other alignments that would have seen the light rail line follow McMurchy Avenue, McLaughlin Road, Etobicoke Creek and/or the Orangeville-Brampton Railway were rejected as they were found to be inconsistent with various planning policies, including the city and regional official plans and economic and transportation policies. The various other alignments would be less direct, follow active railways or floodplains, and move the LRT away from Main Street, but in the neighbourhoods of other, less wealthy residents. If money weren’t an object, the first tunnel option, with stops at Nanwood and Wellington, would be a reasonable compromise. It maintains the linear alignment most suited to moving passengers, it gets the LRT to Downtown Brampton, the Queen Street corridor, and the GO/VIA station, and it placates the local NIMBYs worried about light rail trains operating on Main Street. But the City of Brampton, when it rejected the alignment north of Steeles Avenue planned during a multi-year TPAP, threw away the $200 million the province was prepared to spend on that segment. If Brampton ends up deciding to extend the LRT, it’s already in a $200 million hole, unless it can convince Queen’s Park to give that money back. If it decides to build a tunnel, it will dig itself even deeper into that hole. The cheaper of the two tunnel options misses useful stops at Wellington and at Nanwood, where the Brampton Mall lands provide an excellent opportunity for urban intensification. The status quo. Brampton City Council balks at the costs of each alternative alignment, and the Hurontario-Main LRT terminates at Shoppers World. Maybe in a few years, Brampton will realize its mistake, à la Mesa, Arizona, and approve and build the extension. I see this as the most likely outcome. A return to the surface TPAP LRT alignment. Brampton City Council, once again faced with a staff report advocating the direct Main Street alignment, balks at the cost of the tunnel, and decides to reverse position, even begging Queen’s Park to provide funding. Will a dysfunctional Brampton City Council come to this decision? Possible, but unlikely. A go-ahead for a tunnel. With the recent election of a new Liberal government committed to building infrastructure, there’s a slight chance that Brampton would find enough support from upper levels of government for partial funding for a $410-570 million tunnel into Downtown Brampton. But it will be up against many competing bids for transit funding. 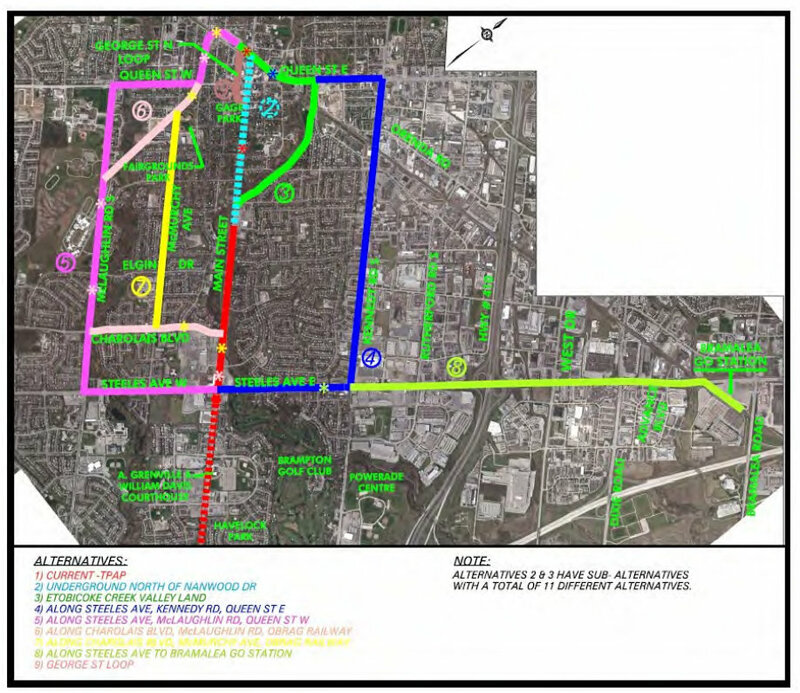 London, Ontario has a plan for a rapid transit system. Ottawa is ready to start building Phase II of the Confederation Line LRT. And, of course, Toronto has several plans for new subways and LRT lines. Will Brampton be willing to go it alone? As Lisa Stokes points out, Brampton already has a $1.5 billion infrastructure gap, and there are many other projects that the city needs in the short to medium term, such as a second full-service hospital campus, a central library, a permanent market space, or simply repairing the roads, parks, and recreation centres in dire need of attention. So because of its rejection of a financially and technically sound surface routing last October, the City of Brampton will likely go through a new round of project assessments. It will also have to go begging for money to build their preferred alternative. Without even starting construction, City Council dug a pretty deep hole for itself. Can it dig itself out? This entry was posted in Brampton, Transit and tagged Brampton, Hurontario-Main, LRT, Main Street, Metrolinx. Bookmark the permalink. I love your Simpsons analogy. Thanks for the update on the Brampton non-LRT. Hopefully they can come to their senses. When will the Metrolinx/Ontario government grow a pair and start to demand things to be done their way from a macro-regional perspective on behalf of the people of Ontario? Regional transit planning should not be bogged down by petty local politics, we are wasting decades and millions of dollars. Thank you Sean for your insightful blog. For completeness, you should create a section with links to articles you’ve written for other publications (such as Spacing).